Property 5: Caravan in the orchard with a view. Property 6: The old bakery cottage located on the waterfront. Property 13: Self Contained Chalet with private spa...perfect!! The best part of our stay was the view, just lovely. The bach itself is small, which we knew, but it needs a little more care than it appears to be getting. The double bed was very small but good quality. The little oven worked okay, but it was awkward to cook on the burners. For the price in this area, it was fine for five nights. Oh, the noise from the main road was a real minus. We spent nearly three weeks in this little piece of paradise. 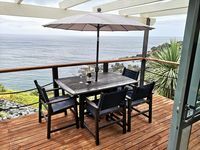 The cottage is welcoming, exceptionally well-equipped, spotlessly clean, and most definitely has the promised stunning view of the ocean as well as a night sky filled with a million stars. We had mostly sunshine and blue skies &amp; sparkling ocean with a few days of stormy weather for a change. The pool was lovely even on cool days. Kathy &amp; Garry were the perfect hosts &amp; we enjoyed our daily visits with the dogs! 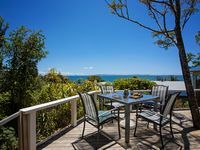 It's about a 40 minute drive to Kerikeri - a great town with a couple of nice walkways,- and a 2 minute drive to Mahinepua Beach &amp; walkway. Matauri Bay beach is also not far and a perfect beach for walking, swimming, or boogie boarding. We recommend a boat tour of Whangaroa Harbour &amp; perhaps the Lane Cove walk if you're feeling energetic. Highly recommended!